Keep yourself protected from EMR when you’re out and about. The Harmonywear Pendants and pearl bracelets create a harmonizing field of negative charge around your body that may support and balance the human energy fields and meridians, neutralizing the depleting positive charge energy influences from all sources of Electromagnetic Radiation. The Harmonywear range was created for continued EMF protection while you’re out and about and away from the protection of the Geoclense® environment at home or work. By wearing the Harmonywear Pendants and Bracelets, your energy levels may be increased due to the supportive and strengthening effect the pendant has on our energy fields, meridian system and vital organs, which are weakened by the various noxious EMR fields. GDV Kirlian Photography: Left image shows the Aura with no personal protection. The right image shows the Aura after wearing Harmonywear for 24hrs. Harmonywear may be especially beneficial to people who are very sensitive to EMF and suffer from Electro-hypersensitivity and Chemical Sensitivity. The Glass Pendants are made from glass with sterling silver chains. The Shell Pendant is made from natural Kabibbie shell with a vegan-friendly cotton cord. The Kabbibie shell Pendant is popular with both males and females. The Pearl Bracelets are made from freshwater pearls and natural stones with their own unique coloration. “My children and I have been using Orgone Effects pendants for many years now. This photo was taken on my daughter’s 20th birthday. “I just wanted to tell you about my awful day visiting Melbourne last week without my pendant! Having become reliant on your pendant! I’ve been feeling so centered and well wearing the pendant, so my bad day came completely unexpected. We arrived from Euroa at Southern Cross Station right on lunch time and then walked to the corner of Queen Street and Collins Street, amidst all the lunchtime people rushing past us in every direction. On arriving there I became absolutely shattered, had to sit down, and then had to take the tram back to the station. “Hi Gerard, A quick note to let you know my order arrived safe and sound. I have been wearing the pendants only for a couple of days, but I absolutely love them 🙂 Thanks heaps.” Lyn. Who needs to wear a pendant? Everyone! Pendants are designed for people from the age of 4 years and upwards. We don’t recommend a pendant for infants and toddlers as it may pose a choking hazard. When do I need to wear the pendant? If you have a Geoclense plugged into the house, then you don’t need to wear the pendant while at home. The pendant was created for continued electromagnetic radiation protection while you’re out and about and away from the protection of the Geoclense environment at home or work. However, if you have specifically chosen a color to support an organ, you may still benefit from wearing it in the house with the Geoclense operating. What are the pendants made from? The Orgone Ionic Personal Pendants are made from our own specialized energy infused inert resin which is color fast and will not out-gas or cause skin irritation, and are supplied with a vegan friendly cotton cord. The Harmonywear Pendants are made from glass with sterling silver chains. The shell pendants are made from natural Kabibbie shell with a vegan-friendly cotton cord. The pearl bracelets are made from freshwater pearls with colored glass beads. Do I need to wear a pendant when I sleep? No, not if you have a Geoclense operating in the house. Can I wear my pendant in water? Yes. 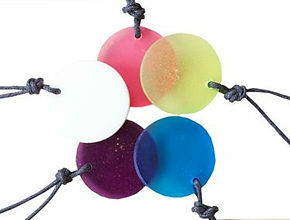 The Orgone Pendant is very durable and can be worn in the shower or bath or while swimming in the ocean or a chlorinated pool without damaging the pendant. Do I have to wear the pendant against my skin to be effective? If you’re wearing a pendant purely for EMF protection and not the secondary benefit of supporting an organ, then it doesn’t matter whether it is on the skin or not. If the pendant is being worn as EMF protection and to support a compromised organ, then the pendant is best worn against the skin. Does the pendant need to be around my neck to work? No. Many women will place their pendant in their bra or pocket if it clashes with an outfit they are wearing that day or evening. In other words, the pendant doesn’t have to be worn around your neck to work, as long as it is on the person, it will be effective. How do I know what color is best for me? While all the colored pendants will neutralize the effects of EMR in the body, getting the right color match to your organs can have a beneficial and profound effect. With most people, whatever color they are intuitively drawn to, will suit them best. However, if you have knowledge of weaknesses in different organs of your body, you may want to choose a pendant color that corresponds with the nearest chakra color to that organ. For example, people who have a liver disorder and who are sensitive and highly affected by EMF, find the green pendant is very supportive. Anyone with thyroid/thymus issues prefers the effects of the blue pendant. Those with heart issues, tend to warm to the pink pendant. People who may have no fixed concern, gravitate to the white pendant and those with spiritual issues reach for the purple pendant. How long do the Pendants last? The harmonizing ability of the pendant will not decay over time which means they will last forever. Will the pendant protect me from other peoples’ negative energies? It may, especially if you’re wearing a pendant of the correct supportive color. For example, a customer who suffered terribly from the effects of other people’s unbalanced energies found that by wearing the green pendant, which supported her liver, she was not affected by these energies from other people. Will the pendant accumulate any negative energies from other people or from the wearer? If I’m wearing a personal tracker, will the pendant protect me from its electromagnetic field? Yes. Especially if the pendant is worn against the skin. Which pendant is best suited for males and females? The Kibbibie shell is very popular with both males and females. Will the pendant leach any toxins or out-gassing? If I chip my pendant will it still work? Do the pendants need charging like a crystal? Independent GDV Kirllian Photography test of the Harmonywear Pendants on the human bio-field. The left image shows the Aura with no personal EMR protection. The right image shows the Aura after wearing the Harmonywear Pendant. "My children and I have been using Orgone Effects for many years now. This photo was taken on my daughter’s 20th birthday. We know it makes a massive difference to our energy and our immune systems. Thank you so much, Gerard Bini! I prescribe and recommend your products to all my clients." I have been using Gerard's Geoclense product ever since spending the night at my parent’s place (they own a Bed & Breakfast in Wonthaggi, Victoria), where the Geocleanse was installed the night Gerard was staying there. Overnight, I noticed a distinct change in my emotional state, and an overall sense of well-being, and I immediately became curious about these products and the technology. Since then, I have purchased a Geoclense for my own home and began wearing his ionic pendant and they have both made significant improvements to my physical and mental health, and I have achieved goals that I had previously lacked the motivation and will-power to achieve. I have noticed an increase in my energy levels, particularly when coming home after working at my office all day in front of the computer. In fact, after forgetting to wear my pendant one day, I was particularly moody, lethargic, and grumpy when I came home - I used to think this was normal! Since being exposed to Gerard's products, I can identify a very positive turning point in my life and I am extremely grateful for discovering this technology. Also, the guests regularly comment to my parents on the restful night’s sleep they had while staying at their B & B (State Mines Hotel B & B), where the Geoclense remains installed. “I just wanted to tell you about our awful day visiting Melbourne last week! Without my pendant! Having become reliant on your pendant! I’ve been feeling so centered and well wearing the pendant, so my bad day came completely unexpected. We arrived from Euroa at Southern Cross Station right on lunch time and then walked to the corner of Queen Street and Collins Street, amidst all the lunchtime people rushing past us in every direction. On arriving there I became absolutely shattered, had to sit down, and then had to take the tram back to the station.